League tables have shown which primary schools have improved the most in terms of results for children taking Sats in English and maths, but what is the secret of their success? For a school placed under special measures four years ago, Rose Hill Primary is having a good day. In league tables based on national curriculum tests for 11-year-olds in England, it is the most improved. The percentage of children reaching the required standard in both English and maths at the Oxfordshire school has risen from 19% in 2008, to almost half in 2009 and now just over three-quarters in 2010. Head teacher Sue Mortimer, who took over in 2006, said: "It's all part and parcel of our move from special measures to being a good school," although she added that it had been "difficult at times, but also very rewarding". Her role was praised in the most recent Ofsted report, which said a major factor in improvement was "the vision, determination and drive of the head teacher, ably supported by senior leaders and governors". Improving the quality of teaching, including making the curriculum more relevant to the children, was important, with the "huge support" from the local education authority's primary strategy team. When a school is placed in special measures it is felt improvement will only be made if extra support is available from the local authority and possibly other sources. Mrs Mortimer emphasised that the school had worked hard to raise the expectations of both staff and children. "Today we're the most improved - next step is to be the best in our area and then the best in England," Mrs Mortimer said. The proportion of children in a school reaching Level 4 in both maths and English has long been used as a government benchmark. Coming second to Rose Hill Primary was Hapton Church of England School in Burnley. Of the 17 pupils who took the Sats in 2010, 88% achieved level 4 in both English and maths, up from 33% two years ago and 55% last year. Head teacher Kathryn Marney said when she became head teacher five and a half years ago behaviour was poor. Inspected within three months of taking over, Ofsted concluded, in Mrs Marney's words, "there was a long way to go". Improving behaviour was the focus of her first year at the school. "You have to get bottoms on seats before you can teach," she said. "The concentration wasn't great and the expectations from staff were not great. The children didn't seem to understand what the school rules were. We improved the discipline and behaviour policy. They had to understand that there were consequences to their actions. It had an almost immediate effect." She then moved on to "changing completely" how the school taught English, switching to synthetic phonics - where children learn the sounds of letters and groups of letters before putting them together. The government and Ofsted have said synthetic phonics must be taught rigorously and systematically to have the best effect. For Mrs Marney "it was a whole different way of teaching, in small groups and not big classes". When it came to maths, she said the school devised its own method of teaching based on basic skills, with daily work on tables and addition, subtraction, multiplication and division. She praised the "very talented" teaching assistants, who work alongside a class teacher, sometimes working one-to-one with individual pupils or with a small groups. In the 2008 Ofsted report, it was noted that it was difficult to tell the difference between the teachers and the assistants because the assistants were so well trained. 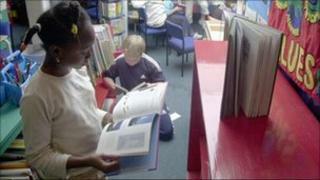 For Loxdale Primary School in Bilston, West Midlands, a similar theme emerges. Head teacher Patricia Scott is adamant there is no secret to their success with the 21 pupils who completed Sats. "It's been down to the hard work of the staff and the full support of the local authority," she said. Loxdale Primary School also used the phonics system for English, introduced just before Mrs Scott became head teacher in 2008. Also key to improvement was the school's tracking system to ensure every child is keeping up. "It clearly identifies any pupils who are falling behind, and gets them one-to-one support," she said. "We're very pleased that the standards have gone up. It means the children are fully equipped with the skills for going on to secondary school, and this is the key to getting out of poverty and increasing their opportunities in life." Two years ago 40% of children sitting the national tests achieved Level 4 in English and maths, rising to 70% last year, and 95% in 2010. "We pleased that we're maintaining standards, but we're also wanting to continue improving," she said.